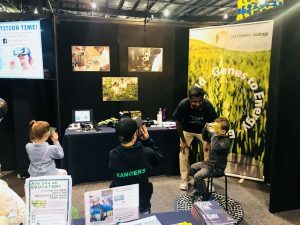 ARC Centre for Excellence in Plant Energy Biology took part in Science Alive!, the largest single interactive science exhibition in Australia. This event draws in more than 25,000 attendees from around South Australia and exposes them to the wonderful world of science. We prepared fun activities like growing Cress seeds in portable containers in either salt solutions or freshwater to educate students on the impact of salinity on plant growth. Participants were able to view the Virtual Plant Cell 360⁰, either with a VR Headset or a cardboard headset for younger children. VPC 360⁰ was launched by Plant Energy Biology at the Perth Science Festival in 2016. This is an interactive and engaging way for the students to understand the inner workings of a plant cell and proved to be entertaining too! If you are interested in watching this video, you can watch it here.